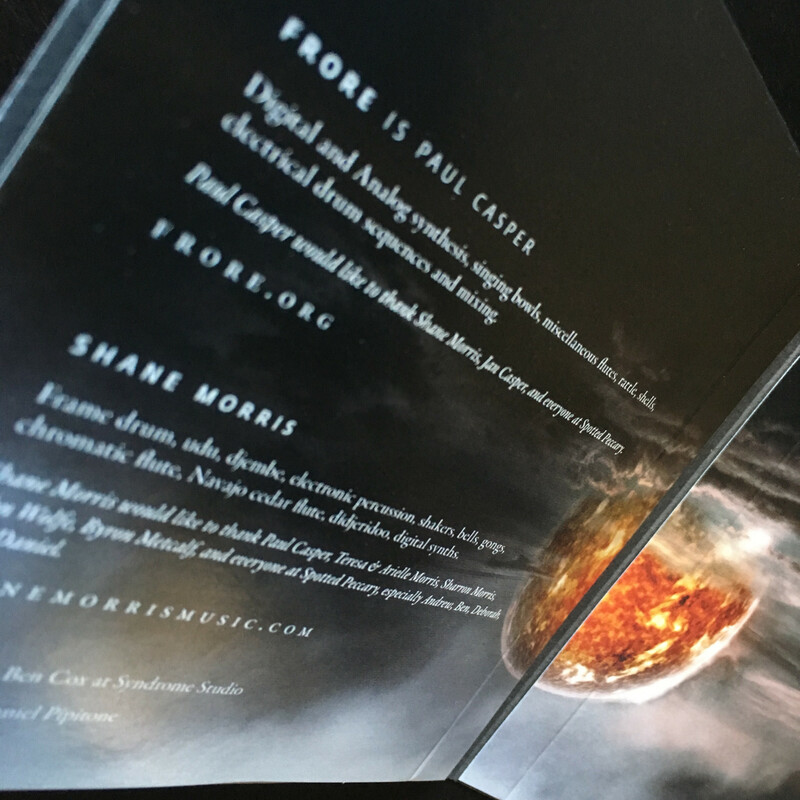 In April 2015, Paul Casper alias Frore and Shane Morris released on Spotted Peccary their first collaborative milestone entitled "Blood Moon", which certainly belonged to the highlights of 2015. Two and a half years later, both these hugely talented and crafted US soundcarvers returned again, this time with "Eclipse". Out since November 17th 2017, again on respected Spotted Peccary label, the CD comes in a 4-panel disc eco wallet, it's mastered by Ben Cox of Lotuspike fame and designed by Daniel Pipitone Pipitone. Nearly 9-minute "Anima" reveals this thrillingly rewarding journey with masterful blend of vivaciously galloping percussive tapestries, primarily driven by hypnotic frame drum mastery, and radiantly charged cyber-shamanic vistas, while intangible didge calls are hovering above. A top-notch, all-inclusive overture precisely displayed by its title! Primordial acoustic reflections on "Calling Down The Sun" soothingly commingle with balmily drifting expanses, before gradually metamorphosing into artificially infused tribal splendor. Mesmerically languish, yet engrossingly piquant. Another magnificent blend of primitive acoustics and state of the art electronics, bravo, gentlemen!!! "Feather And Claw" attracts with its gently cadenced percussive guiding juxtaposed with enveloping flute narrations. "Stone Arch", as indicated by its name, shifts into gracefully panoptic grandness, where hidden dramatic nuances continuously commingle with glimpsing meditative quietudes. "Shadow Medicine" is propelled by laid-back high-tech grooves with persistently glistening scenario, guarded by above gliding ethereal flute moans. "Nomadic Dreaming", at 10:47 the longest piece on "Eclipse", immediately carves eternally helixing futuristic images, lushly blossoming, profoundly spellbinding, electrifyingly kaleidoscaping and exquisitely opiating, what a magnum opus!!! A headphone listening quickly unlocks the gates to the cyber-tribal paradise, obviously a Hall of Fame performance is exhibited here, hats off to Paul Casper & Shane Morris!!! The next track, "Changing Seasons", meticulously merges primeval didge and flute drones, growls and murmurs with steadfastly exhilarating percussive ambrosias, while delightfully longing and sweepingly awe-inspiring panoramic time-lapses are riding atop. Wow, I am blown away again by such creatively spirited insignias, this composition without doubt deserves just the same praised spot as its predecessor. So another standing ovation for both gifted protagonists!!! 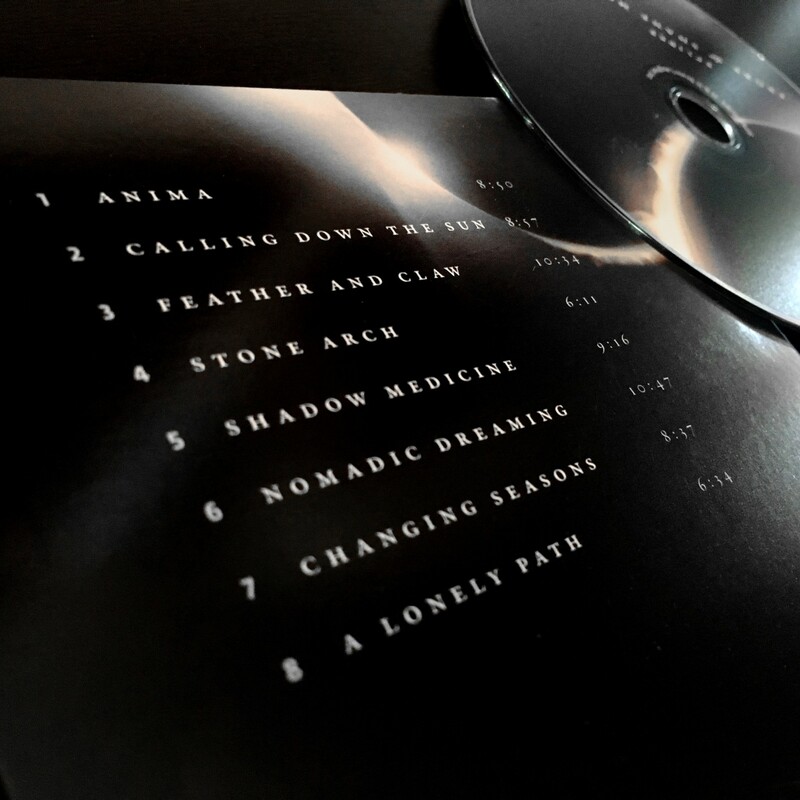 "A Lonely Path" is carried through subterraneanly monochromatic drones into stunningly sonorous ancient landscapes, where abundantly organic subtleties inconspicuously permeate along with prodigiously engulfing woodwind curlicues. Splendid conclusion indeed! I have always been a fan of Spotted Peccary music as it seems that they have a very enviable track record of releasing some of the best music to be heard in the ambient and associated genres fields. I don’t say this lightly because there are many albums that cross my desk in any given week but it seems that every time a Spotted Peccary release appears I know that I can expect to hear some of the finest music being released and that I’ll probably want to review it. 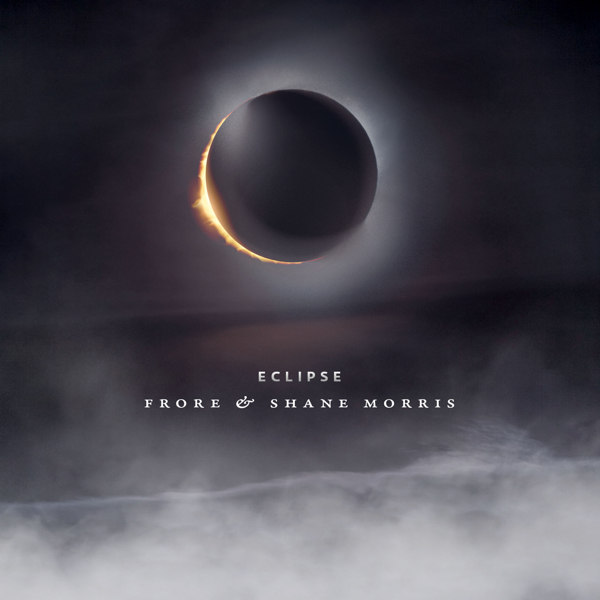 Case in point is the new release called Eclipse by Frore and Shane Morris which will be released to the world on 11/17/2017 but which showed up in my e-mail box last week as a review copy from Spotted Peccary. Frore aka Paul Casper is from Virginia Beach, VA and is a self-taught musician who works with digital and analog synths, singing bowls, flutes and electrical drum sequencers while Shane Morris hails from Fayetteville, Arkansas and has achieved a high level of mastery with percussive and wind instruments from all over the world including the frame drum, Navajo cedar flute, didjeridoo and electronic percussion. While this list may help you get a handle on some of the instruments that figure prominently on their new release Eclipse it does not even come close to telling you what can be done with those instruments in conjunction with two talented musicians who blend their musical visions into a single coherent statement that results in the imaginative tribal landscape that you will hear on Eclipse. A paint brush in the hands of an amateur yields average images and lacks true vision but put that same paint brush into the hands of a dedicated artist and the images on the canvas will astound. The same can be said of the musical instruments I mentioned at the beginning of this paragraph in the hands of artists like Paul and Shane. Music can be entertaining, music can be comforting, music can distract you from the stresses that tear at you each day but some music touches places deep inside a person that some might call meditative, spiritual, shamanic or even mystical in nature. Eclipse is music that reaches inside a person and gently tugs at those strings. Those strings are connected to aspects contained in each of us but which are not always utilized or accessed by a great number of people in our modern world. Often ignored and rarely sought out. Whatever word you wish to apply to it is fine but as a deeper listener you will feel the same thing as I do. The album is aptly title Eclipse and for those in ancient times the eclipse represented something frightening and something that left them in awe as they attempted to understand and explain what they were witnessing. Even in the 21st century and having recently had an eclipse that was visible in many places in the U.S. it still evokes wonderment even though we know in theory why and how the eclipse is happening. Naming the album Eclipse set out the goals of what kinds of feelings and emotions the music would inspire and the journey that Paul and Shane were setting out on as they crafted the compositions that would eventually make up this most otherworldly excursion. On the Spotted Peccary page for Eclipse they refer to the music you will find on this release as tribal-ambient soundscapes and as I sit writing this review and listening to the music I can find no better descriptive term that would communicate what the listener will find once they cue this music up. The compositions are the perfect merging of organic elements and instruments right alongside the electronic sound palettes skillfully balanced so that the listener only hears the music and is completely pulled into the undercurrents of the flow. With this kind of album it might be a good idea to set aside some time for a deep listening session as you play through it for the first time. As with most voyages using this type of music the music will act as a guide and as a conduit that carries the listener along and allows them to step away from their day to day existence for just a bit and to experience those areas of their personality that they might not ordinarily get a chance to see. There are several compositions that have an almost hypnotic beat that helps the listener to let go of the everyday and to focus in on where the music is leading. The best example of this on Eclipse are the songs Shadow Medicine and Nomadic Dreaming which are 20 minutes’ worth of ecstatic compositions that are very trance like and if put on a repeat would be perfect for an extended journey all by themselves. The album moves through a variety of emotional states over the course of the 8 tracks that comprise Eclipse with each song flowing seamlessly into the next so that as you listen you aren’t really aware that the song changes so much as you are simply moving to the next phase of the trip, a continuation of the expedition of self-discovery that you are on with Eclipse as your guide. All the tracks on Eclipse are exceptional so you won’t find me trying to name my favorites in this group of compositions. I think what you will find as you listen to Eclipse is that each song tends to evoke certain images and emotions and of course that will be different for each listener depending on where they are at on their own life’s path. Some songs are flowing and wash over you like stepping into a warm moving stream and submerging yourself in the flow and becoming one with the water while other songs are more powerful and soul stirring which brings the mind into focus and forces you to see the world around you and your place in it. 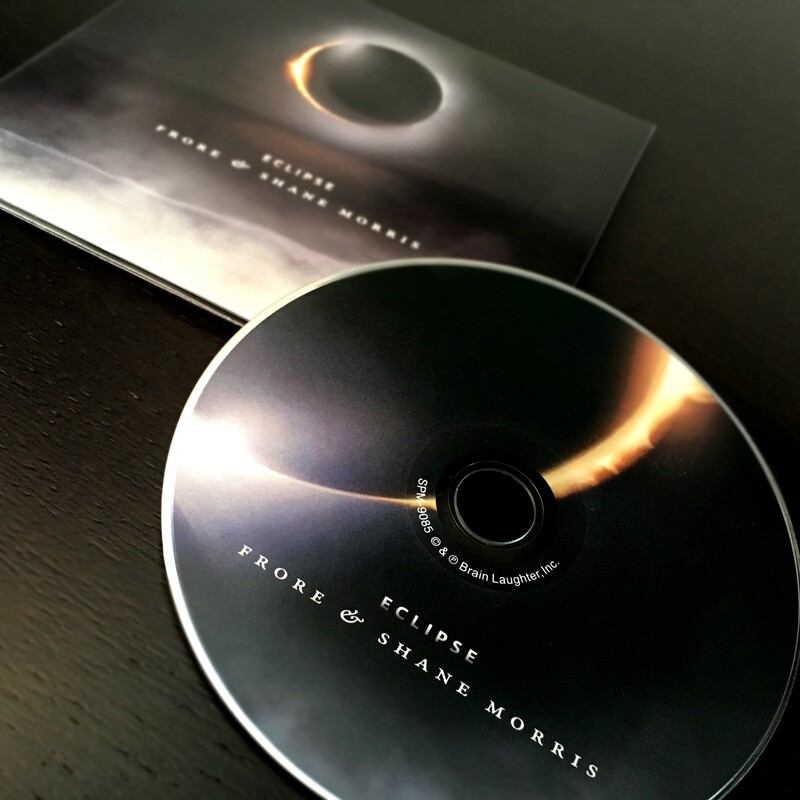 'Eclipse' is the second collaboration between Frore (Paul Casper) and Shane Morris after their previous 'Blood Moon' (2015). Together these musician composers explore the boundaries of ambient and tribal, merging the organic with the electronic. Utilizing digital and analog synths, didgeridoo, ethnic flutes, gongs, djembe, singing bowls, frame drum, and udu pots, Frore and Shane take the listener on a journey to the depths of the psyche through primordial roots to transcendental peaks and lush valleys. Hypnotic hand-drumming plays a large part in this, with nearly every track exhibiting some sort of polyrhythm. The drums are rather upfront in the mix too when they need to be, nearly ceremonial in their manner. Synths of course carry the ambience in sustained drone-like pads as you might expect. Throughout the eight somewhat lengthy tracks on 'Eclipse' there is an aura of mystery and magic that emphasizes the ritualistic and shamanic. The music is neither complete dark nor light, but falls into that grey area that the title and CD cover perfectly illustrates. A good amount of this must have been improvised but these guys work so well together there is no stepping on toes, nothing out of context, nothing that doesn't work or feel contrived. While there is melodicism the melodic content is amorphous supportive of the ambiance rather than dominating it. That may seem (in description) that the music is simplistic, but in actuality, far from it. The layering is complex in that there is much going on within the ambiences. Believe me this is full, rich and heady stuff. I know from my experience with Malaysian Pale back in the '80s that making electronic world music of substance can be a real challenge. Here Frore and Morris live up to and often surpass the challenge in a path well-trodden by other artists in the ambient-tribal domain such as Vidna Obmana, Steve Roach, Robert Rich, Matthias Grassow and other similar artists. The flow from track to track is really great too lending itself to a seamless listening experience with nothing disjunct or jarring by juxtaposition. The only misgiving I had about 'Eclipse' was on the final track "A Lonely Path" where it seemed like it should have been building to some conclusion but just ended up petering out. The artists likely had a different take on this but to me it seemed inconclusive. Overall though this is a very worthy work if you're into ambient-tribal, and will probably spend a good while on my current and future playlists. - Steve Mecca, Chain D.L.K. Spotted Peccary's output might emphasize luscious electronic-ambient soundscaping, but its discography encompasses other realms, too. Indicative of such heterogeneity, the material presented on Eclipse is tribal-ambient of the kind generally associated with figures such as Steve Roach, Robert Rich, and Byron Metcalf, with in this case alchemical shamans Paul Casper (aka Frore) and Shane Morris donning the ethno-electronic garb. Preceded by the duo's first collaboration, 2015's Blood Moon, Eclipse guides the listener on a seventy-minute, eight-part journey through tribal soundworlds that seem both primal and futuristic, in large part due to the music's wedding of spacey electronic textures and earthy percussive elements. While their roles would appear to be fairly clear-cut, Morris the percussion side of the equation and Casper the electronic atmospheric half, the truth isn't quite so simple. Yes, the latter is credited with analog and digital synthesizers, but he also contributes singing bowls, flutes, rattle, and shells to the release; for his part; Morris plays frame drum, udu, djembe, shakers, bells, gongs, and electronic percussion, but also flute (chromatic and Navajo cedar), didjeridoo, and digital synthesizers. On second outing Eclipse, the intuitively complementary duo of electronic musician Paul Casper (Frore) and multi-instrumentalist Shane Morris does an exquisite job conjuring wondrously mysterious vibes of tribal mysticism: Wide-scope cinematic soundscapes establish awe-inspiring atmospheric foundations over which varied ethnic percussion (djembe/gongs/udu pots/frame drum) and exotic tonalities ( flutes/didgeridoo, etc.) coalesce into mesmerizing grooves evoking man’s ancient spiritual connection to nature, the planet and ultimately, the cosmos. Frore & Shane Morris we’re both new to me and after reading the press release I was a bit curious to see how well they would do because of comparisons to Vidna Obmana, Robert Rich and Steve Roach. That is some pretty big shoes to fill but o do have to say they succeed in walking those same paths while still standing out. Eclipse is filled with 8 tracks most running right around 8-10 minutes a piece and lays down some excellent slow tribal drumming with some beautiful ambiance. It is very easy to throw the album on and zone out for the hour plus that this album runs and just enjoy the ride. - Marc Benner, Chain D.L.K.